You’d think that going to your mum’s funeral on Tuesday would get you the rest of the week off, but not according to my dad. “We need to get back to normal,” he says when I try to protest. 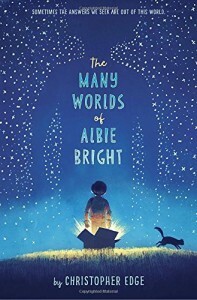 The beauty of this children’s book is that it explores the delicate balance of life, where our path hinges on just one small change, somewhat like “The road less travelled.” The book offers lots of humor and pathos, and is quite brilliant as Albie explores the ways he could have had a different life, finally making peace with things as they are, with life and death. This children’s book also has a fair share of good scientific musings in it, so it is a perfect book for young scientists with an budding interest in how the world works. It could lead them to explore the real places mentioned in the book, such as CERN and the Hadron Collider. In short, this children’s book is a terrific merging of heart and mind, feelings and science, and sincere family issues. PS: I hesitate to label books by gender, but the presence of a boy as the main character does make it appeal to boy readers, who often need an extra carrot to dive into literature.